The European bison (Bison bonasus) is a beast brought back from the brink. Only 54 individuals were left in captivity after the last wild bison was shot in Poland’s Bialowieża Forest just after the First World War. There are now around 3000, about half of these wild, thanks to reintroduction programmes. Herds now tread in Russia, and several European countries including Poland, Lithuania, Germany, Spain, Denmark and the Netherlands, although the species is still threatened by the small genetic stock they descend from. Bison tot up some very impressive stats, standing up to six feet tall, eleven feet long and weighing up to a ton. An important keystone species, huge herds of this gigantic herbivore once roamed from central Russia to Spain, in wild steppe regions and dense forests. Enthusiastic diners, bison consume vast quantities of grasses, trees, leaves, shoots, mushrooms and mosses daily, churning soil with their wandering hooves. Their behaviour helps support a variety of species by maintaining a mosaic of habitats, including woodlands and scrub. In densely wooded areas they help to create open glades, where sunlight can wink through to the darkened forest floor, supporting flora diversity and in turn giving rise to increased animal diversity. Their carcasses, when left to decay naturally, also provide an ample food source for many species for several weeks. Bison also help spread seeds, which are excreted in their dung. The remaining European bison are the last vestiges of an ancient, and once venerated beast. 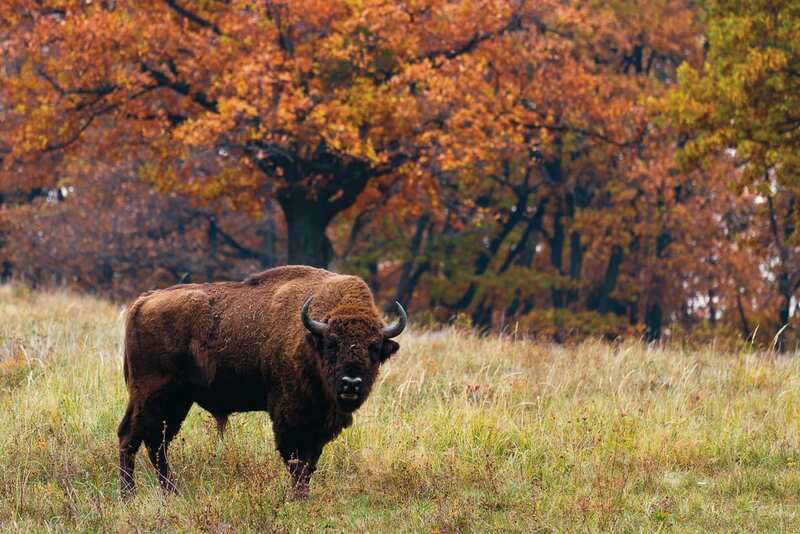 Thriving in Poland up until the early twentieth century, bison were protected by Polish Kings, and latterly Russian tsars, in Royal hunting forests. They came to the brink of extinction during the First World War, when starving people of war-torn Poland were forced to hunt them for their meat. When the last wild European bison was killed in 1919, the captive animals used to re-establish the species were mostly gift animals from Bialowieża, presented by Poland to foreign capitals and kept in zoological gardens. Elsewhere, by the end of the 19th century, bison were almost extinct, with only one other population outside of Poland in the West Caucasas mountains. Agriculture and forest logging led to loss and fragmentation of their habitat, and they were also subject to heavy poaching and hunting. Chocolate brown, with great hulking shoulders that taper to a narrower rump, bison have long slim tails and short, curving horns which were used as Middle Age drinking horns. Winter sees the bison form large herds, that splinter into smaller maternal and bachelor male groups when spring brings plentiful food. Bison live for around 25 years, having on average one calf annually during their breeding years. Historically, in early European cultures, bison were highly honoured as symbols of natural power and homeland. Their cousins, American Bison (Bison bison), are regarded in Native American folklore as symbols of strength, endurance and protection. Some legends tell of bison being placed on earth as a source of food for people, and as such deserve the highest respect, and cautionary tales of hunters being killed by bison serve as warnings to honour this mighty animal. In modern times, so often darkened by ecological atrocities, bison can perhaps serve as a symbol of hope; they came right down to the wire and nearly joined the long list of animals that will never again roam our Earth. Yet, thanks to the dedicated efforts of conservationists and support from the public, certain parts of the world are that little bit more enchanted, more wild, for the presence of these magnificent beasts, living quietly in the forest. Our overgrazed land in the UK could not yet support such a large browsing herbivore, but when the wildwood is restored, and tangled forests grow in land once bereft of life, perhaps Britain could host this woolly giant in its wild spaces.